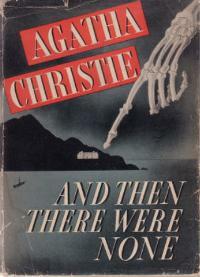 And Then There Were None by Agatha Christie, teaches us about the consequences of revenge because many people die in this story through the process of vengeance. This story occurs at a small island called the Indian Island, since all characters of this story obtain a letter instructing them to meet at Indian Island. The letter was signed, “Yours truly, Mr. Owen”. When everybody arrives, Mr. Owens is nowhere to be found, so they just go inside the booked mansion to settle down. Halfway through dinner, one of the guests, Rogers, starts playing a disc on the gramophone, saying that it was what Mr. Rogers trained him to do. However, when he turned on the gramophone, a loud voice boomed across the room. The voice talked about all the different crimes that the following guests were charged for. Throughout this story, many of the guests die, but the freakier part was that whenever one was killed, one of the American Indian figures in the cabinet would be smashed. The killer was clever enough to match each of his murders with the lines from the poem “Ten Little Indians”. The killer devised his plan so that all of the people who hurt him emotionally died and so, he got what he wanted: revenge. Plus, investigations and detectives in the future will never find out the reason behind the death of ten people on a stranded island with no killer in sight. My first reaction after I picked this book was how old fashioned the writing was, but after awhile, I got used to it. The story structure was well designed and the overall content was great! This is definitely one of the best mysteries I have ever read, and normally, mystery books are pretty predictable to the point where you know who’s going to die next or who the killer is, but in this book, it is very mysterious, and I was really shocked when I found out who the killer was. The tone and the mood was capricious, and this book is appropriate for all levels, although kids aged under 12 may find some scenes scary, and there will be some swearing ; otherwise, children to adults will love this book, and I would definitely rate this mystery an 8 out of 10 stars because of the not-so-good word choice and the somewhat-boring beginning. 1. Where does Constance Culmington ask Mr. Justice Wargrave to meet her? 2.Who was unable to reach Indian Island until the next day? 3. What are all 9 guests guilty of? 4. Who was ordered by Mr. Owens to turn on the gramophone? 5. Who died after ingesting potassium cyanide? 6. Which poem does the 2 deaths correspond to? 7.Who is investigating the 2 deaths? 9. Who was the 4th person to die? 10. When was Rogers killed? 10a. He was killed when he was outside chopping wood, and he didn’t notice the killer. 11. How did Vera almost die? 13. Who was the last person standing? Why? 14. How did Vera die at the end? 15. What happened to the chair that Vera hanged herself with?